The unpleasant consequences of having a toxic build-up in your body and be hard to live with. Sometimes, it can even lead to disease. Some of the most common symptoms are bloating, a sluggish metabolism, irregular bowel movements and fatigue. It can also lead to excess water retention and poor immunity, making you more vulnerable to colds and the flu. A detox cleanse is beneficial if you believe you have a build up of toxins. This usually occurs thanks to on-the-go processed food and fast food diets, drinking too little water and exercising too little. There are many detox supplements available. 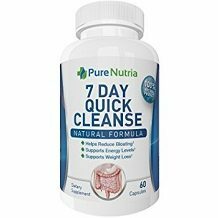 In this review, we take a closer look at Pure Nutria 7-Day Quick Cleanse. The manufacturer promises that the product will help to reduce bloating, increase your energy levels and help you lose weight. These all-natural ingredients are designed to move toxins and waste from the intestines. When the intestines are cleared and healthy, they are able to absorb nutrients better. The regular bowel movements will rid you of sluggishness. It is also a good point of departure for starting on a weight loss program. The ingredients are quite different from those in other detox supplements. Aloe is an antioxidant that soothes irritation as well. Senna helps with constipation and is found in detox supplements quite often. Cascara is also primarily a laxative, while fennel contains powerful phytonutrients. It is also an antioxidant. African Bird Pepper is known to work for a number of digestive ails. It contains capsicum which has also been linked to boosting metabolism. It is clear that this cleanse mainly targets bowel evacuation. Save in the severest cases of constipation and bloating, these herbs and botannicals should achieve this aim. This does help to kick-start the metabolism and toxins are cleared due to the cumulative antioxidant effect. Usually, long-term effects after a detox involve taking probiotics as well. Probiotics are critical to maintaining good gut health. Although there are 60 capsules in the bottle, you should only use it for 7 days at a time. Take 1 capsule each day for 7 days. The product is high in laxative content so IBS and diverticulosis sufferers need to be careful. Stop using the product if symptoms become worse. If you experience rectal bleeding or no bowel movement after 7 days, see a doctor. Do not use if you are under 18. Steer clear of this supplement if you are pregnant, nursing, have abdominal cramps or diarrhea. We do not recommend doing this cleanse twice in succession as this would constitute various risks to the body. One box of 60 capsules is $14.25 on Amazon. A 10% coupon discount applies when you buy your first bottle. There is a 100% guarantee on all products. However, the website is scant on information as to whether you can return opened bottles, and the time period within which you need to do so. 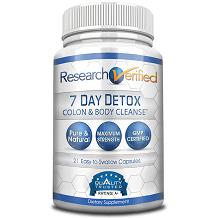 This 7-Day Quick Cleanse is easy to follow as you only take one capsule a day, unlike with some other detoxes where many pills and powders are required per day. The product is also cost effective. You can do this cleanse 8 times with one bottle, but never do it in succession. It targets mainly the colon, and should work well, except in the severest cases of constipation. The product does not contain probiotics, although you can buy this separately from Pure Nutria. Probiotics help you sustain good gut health, and restore the balance of bacteria to the gut. A good detox also targets the liver, kidneys, spleen and blood circulatory system. This product will work well if your main issue is bloating and constipation.